Important Update: Due to changes in Amazon’s Terms of Service, giving away a free or discounted product in exchange for a review is not allowed anymore. Therefore some of the methods described here (such as 2. and 4.) are not viable anymore. Methods like Post-Sale Follow Up Emails (5.) are now even more important for getting genuine product reviews. Around 2/3 of customers read online reviews before making a buying decision, but only a tiny fraction of customers actually write a review of products they bought. No Amazon reviews means almost zero sales, which consequently means no reviews, and the cycle continues. 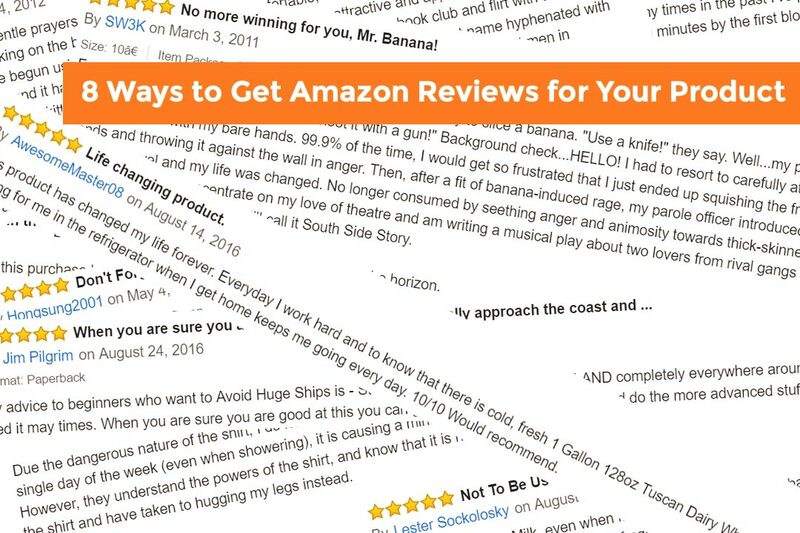 Here are some tips to break the cycle and how to get reviews on Amazon without breaking a sweat. Providing customers a great experience is the first thing when it comes to getting good customer reviews on Amazon and most of the customers that leave negative feedback, are the ones who feel they have been misled. Always be honest about what you are offering and provide customers with precise and accurate information about the products. Customers may not write reviews for products and services they like, but they are very likely to leave a negative Amazon review if their expectations are not met. Don’t set expectations that you are unable to fulfill. This is one of the most effective methods to generate genuine Amazon product reviews. It follows the same old concept of brands giving away free sample products to reviewers and influential personalities, but when it comes to Amazon, an Amazon top rated product review is equal to a review by a high-profile reviewer or journalist. Amazon ranks the reviewers like its Best Seller Rank System and all the top reviewers have a badge, which is displayed right next to their review on an Amazon product page. Reviews by such people carry a lot more weight than an average user and should be particularly focused on for free giveaways. The first step is to find such coveted reviewers, which can easily be done by heading over to the Top Reviewers page. Pointing over to reviewers name will bring you to their most used tags, from where you can see if they are relevant to the products you are selling. You also need to maintain a list of the potential reviewers you found and keep track of their activity. You’ll find that many reviewers have their email listed on their profile page, allowing you to contact them directly. If you cannot find an email address, chances are that you may still be able to contact them through their social media accounts. After you have fished around for emails and contact info, now is the time to reach out and plea your case through a thoughtful message. Carefully draft your message asking them to review your product, which might interest them. Personalization is the key here and do let the reviewers know if you found any of their reviews particularly interesting or clever. Many of them probably won’t reply, but some of them will and that’s what really matters. Amazon’s Vine Program is meant to attract genuine and quality Amazon reviews from the top reviewers and is only available to brands selling through Vendor Central or Vendor Express. It’s a paid option and costs some serious amount of money to run a campaign, therefore it is mostly suited to big businesses. There are many online services that help businesses manage product giveaways in huge numbers and maintain a database of reviewers who are eager to put their skills to the test. Using their services is particularly effective when you are selling a product from a very competitive category and your competitor’s boast of a large number of positive product reviews. However, you need to be very careful not to flood your products with reviews obtained by using these online services. These Amazon reviews are detectable, they can also get your brand/account banned if the reviewers don’t follow the rules. According to Fair Trade Commission rules, a reviewer is explicitly required to mention in the review if he received the product as a giveaway. Some websites also allow users to see the likelihood of a review being from a giveaway promotion, and these things can sometimes result in a backlash from consumers. The most important element of online review services remains legitimacy and simply buying reviews from sites life Fiverr can get your account suspended, in some cases permanently. Never offer incentives for reviewing other than the product itself or ask for a 5-Star review. Both of this is against Amazon’s TOS. This is probably the most straight forward method and works by simply reminding the customers for a review using Amazon’s email system. However, an important thing to remember is that the message should be short, to the point and attention-grabbing as customers already receive a lot of post-sales messages by Amazon and can easily get annoyed. A good post-sale message appeals to the instinctive human desire to be supportive and helpful and could even contain a joke if it compliments your brand. Include carefully written and clever postcards or letters inside the product-box and ask for feedback from the customer without asking them to give a five-star feedback as it’s against Amazon’s terms of service, as well as send out follow-up message by email asking if they’re satisfied with the product and if they like it ask them for an honest Amazon review of your product. Don’t just ask for Amazon reviews, give additional value to your customers by including helpful tips how to get the most out of their purchase. Adding printed material has a more profound effect on readers compared to emails, which customers usually tend to ignore. Asking customers subscribed to your social media pages and newsletter for reviews can also prove to be helpful and these are another potential source of positive and legitimate Amazon reviews. Chances are good that your existing Facebook fans have already bought an item from you, and asking them to support your business by providing a review can potentially lead to a positive review. Bloggers also love to receive free products and many networks like Tomoson can help find such bloggers to write some powerful product reviews. Most of these bloggers may not give you a review on Amazon (some of them will do though), but can put a review or link of your product on their own blog/site. The bloggers can be particularly useful if you are trying to build website traffic and an off-Amazon email list. Finding customers who have already reviewed products similar to what you are selling on Amazon should not be a daunting task. They can easily be traced if you go to your own product page and look for customers who viewed or bought similar items. Competitor’s reviews are also a good source to know what your competitors are good at and what you can do to improve your services. You can even contact these customers, if they have provided their contact details. If you have a good number of people in your network, whether they are your Facebook fans, family and friends, emails collected from your website etc., you can offer them exclusive discounts for writing product reviews. This takes time, but is a real asset in the long run. Planning is the most important part of any marketing campaign and getting Amazon reviews is no exception. Driving your campaign keeping in view the required number of reviews per product helps you set benchmarks for your promotional activities e.g. PPC advertising and 15-20 reviews are recommended for most products. When you have a clear goal in front of you, it becomes easier to execute the strategy and set benchmarks. Creating and maintaining an outreach list of potential reviewers as well as customers who might be interested in reviewing your product comes next. Samples can be sent to potential reviewers by either shipping the product directly to them of via Multi Channel Fulfillment order. A special coupon code can also be created through Amazon that allows them to add your products to their cart for free. The most tedious part of getting Amazon reviews is perhaps the follow-up to reviewers in order to ensure an accurate review is written. You also need to make sure that you get a Permalink for each review. Some users take it too far and pay others to write fake Amazon reviews. This may work for some, but the risks are far too great as your account can get suspended permanently because of such reviews and you may never be able to get back the trust you built over time with hard work. Amazon is always at work to track fake reviews and using fake reviews to boost sales temporarily isn’t just worth it. Not only reviewing your own product is against Amazon’s policy, reviewing from the same IP address you use for logging into your Amazon account, could also prove to be a recipe for disaster and cause your account to be suspended. This includes the discount on future sales, cash bonuses etc. and any increase in reviews this way is certainly not worth the risk of account suspension. Building trust takes time, but in the long run, it really pays off. Using dishonest methods to get reviews may seem tempting, but exposes your business to risks that are simply not worth it. Doing it all under Terms of Services of Amazon is what makes you credible and trustable in eyes of the customers, which requires you to be truthful about your product without exaggerating facts. With years of Amazon Experience under her belt. She's the go-to person for cutting-edge Amazon Strategies and always an edge ahead of everyone else. On Azon Services she's sharing her latest Amazon insights with established and aspiring Amazon Sellers. She holds a Master in Integrated Marketing from New York University. Want to Increase your Amazon sales? With diverse backgrounds in digital marketing, design, product photography and e-commerce, we offer one-shop solutions for your Amazon Marketing. Research, Branding, Copywriting, Amazon SEO and overall growing your sales on Amazon – we can assist getting up and running with Amazon for the first time or expand any existing Amazon business. We specialize in optimizing the experience of every customer when interacting with your brand to create opportunities for long-term customers and brand advocates, leading to sales from word of mouth and an enthusiastic customer base. Contact us today to improve your business! Azon Services is a full marketing service agency for Amazon sellers. Offering Amazon conversion optimization, copywriting & Amazon consulting, we're specializing in launching & growing brands on Amazon and increasing product sales & revenue. Nomad Ventures LTD Copyright © 2018. All rights reserved. Azonservices.com, nor its operators are affiliated with or funded by Amazon.com, Inc in any way.